Bible study and worship at Celebration Fellowship allows me to see Christ in action, to see the Spirit really working in the hearts and minds of people who have very different backgrounds and experiences. The apostle Paul wrote about all who believe, “There is no difference, for all have sinned and fall short of the glory of God, and are justified freely by His grace through the redemption that came by Christ Jesus” (Romans 3:22-24). For over 40 years, I have been in and out of jails and prisons or on parole. I was filled with hatred. I was vindictive. I had no respect for anyone. I only cared about ME! In about December 2011, I met a guy named Jim who was a member of Celebration Fellowship prison congregation. He explained how Jesus Christ paid the price for my sins. ‘But,’ I responded, ‘I have even stolen from churches!’ Jim reminded me: ‘Jesus paid for your sins.’ I cried out to God to just forgive me. you’ve healed my broken heart. When I told my husband I’d signed up to volunteer with Celebration Fellowship, he said I was moving beyond my comfort zone, and he was right. But I’m most thankful I answered the call of the Spirit, prompting me to volunteer. I have learned so much and have found new friends and a rewarding worship community in the Celebration Fellowship congregation. God is at work in the Celebration Fellowship prison congregation and when I responded to his call to join him in this work he began to reveal himself in some surprising ways. Most significantly, I began to understand more clearly my own need for God’s grace and forgiveness. Sitting between a couple of inmate brothers at a Communion service, I realized that our standing before God was all the same. Guilty as charged. Although my crimes are not as public, they are just as condemning before a holy God. I am grateful that God is using this ministry to reveal himself to me and draw me closer to himself. I was a skinny 19-year old when I arrived at prison. Suddenly my family, my school, my teachers, my community, and all the people I knew were gone. The word “scared” does not do justice to my feelings. I had grown up going to church every Sunday, but God became real to me now. God was the only one that who knew my innermost feelings and was the only one I could go to now. He was waiting for me to come to him, after I had rejected him for all these years. He was ready to make my ways straight and keep me under the shadow of his wings, protecting and loving me through these difficult times. After 4 ½ years of grueling, exhausting loneliness, I’ve matured. I’ve made it by God’s grace and by the support of fellow Christians, who are angels that come to bring hope and remind me who I am. The only thing that kept me going and comforted me was the volunteers from Celebration Fellowship church. I could write a book on the different degrees of darkness in this place. The [Celebration Fellowship] volunteers might be the only positive influence. They know how precious life is and how precious every single person is, even those in prison. When I felt like giving up, you [Celebration Fellowship volunteers] came along with the Holy Spirit’s influence and kept me going. 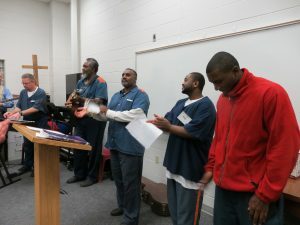 Worshiping in prison is unique. Everyone stands on equal ground. The men at Celebration Fellowship who are serving time are CPAs, drywallers, pastors, mechanics, fathers, sons, orphans, and widowers. Everyone has a story, an important story. Yet the stories fade to the background as we gather for worship in the presence of the One True Living God who loves us each individually and equally.